One of the best places to explore when in Bangalore is the majestic Bangalore Palace. It looks straight out of a dream with it’s mix of Tudor-style and Scottish architecture. Constructed in the year of 1878 by the Wadiyar Dynasty, it was perhaps made keeping the medieval castles of Normandy and England in mind. 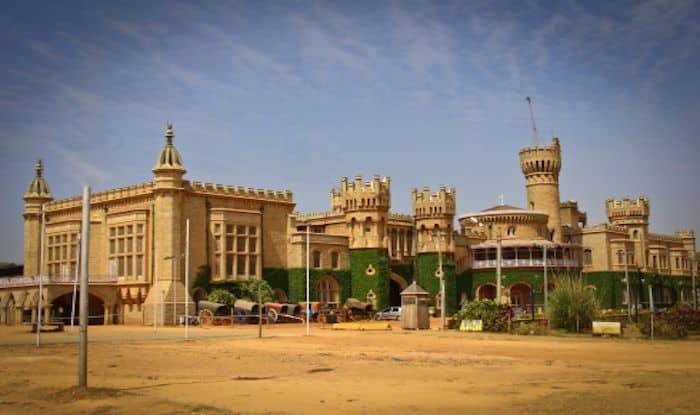 The Wadiyar Dynasty ruled the Kingdom of Mysore from 1399 to 1950, and it is said that King Chamaraja of the dynasty during one of his trips to London, got majorly impressed by the Windsor Castle of London and hence built the palace in Bangalore on similar lines. Though the palace used to be surrounded by beautiful gardens in earlier times, its beauty today hasn’t diminished one bit. Infact, the fortified towers, Gothic windows frames, battlements and turrets are still as charming. The high point of the palace is the wood carvings and elaborate paintings hanging inside; just what regal opulence should be like. Every corner is worth exploring and tells a thousand stories inside the palace: from the granite seats decorated with fluorescent blue ceramic tiles on the Open Square of the ground floor, a fairy tale Ballroom for private parties, the famous painter Raja Ravi Varma’s paintings, vine-covered walls, the Durbar Hall on the first floor where the assembly would be addressed to the dining table of the Diwan of Mysore, Sir Mirza Ismail. Today the palace hosts various kinds of cultural events, exhibitions, concerts and even weddings, along with being open on a daily basis for public viewing. An epitome of great architecture and beauty, the palace is extraordinarily vast and spreads across 45,000 square feet. A visit is recommended to the palace because it gives you a chance to witness the elegant and lavish splendour of one of the most powerful dynasties of South India. Audio tapes are available inside the Palace, both in Hindi and English, to help people having language issues, understand its history better.